Where would we be without axial tilt? Simon Singh has won! Send money. I’m enjoying my high-definition BBC feed while I still have it. Recently, I enjoyed a documentary about Madagascar narrated by Sir David Attenborough. He mentioned a rare carnivore called Grandidier’s vontsira (BBC, Island of Marvels, Part 3. YouTube clip, 0:12:08–0:13:24). I had never heard of it, and no wonder. It’s a rare mongoose found only in a tiny part of Madagascar. It’s like the mammalian equivalent of a snail darter, a tiny fish found only in certain rivers. It took a little while for me to find out more. It’s more commonly called Grandidier’s mongoose. It was named only in 1986 and little is known of its life. It’s adapted to an arid climate, eats small prey and insects, and pairs off to have one offspring. If you watch the video clip, you’ll hear its voice, distant whistles and then a cross between a mew and a coo. Most of the prey items caught are insects but the greater biomass, 57% – 80% depending on the season, comes from small animals. The range map for Galidictis grandidieri is from Wikipedia, and ultimately from the IUCN Red List of Threatened Species, species assessors and the authors of the spatial data. In 2009, the Michigan Department of Natural Resources confirmed signs of an eastern cougar on the upper peninsula. In two places, tracks were found and verified by Department workers and a motion-sensing trail camera took a picture of a cougar. Together, they’re proof that the cougar, Felis concolor, has returned to the U.P. 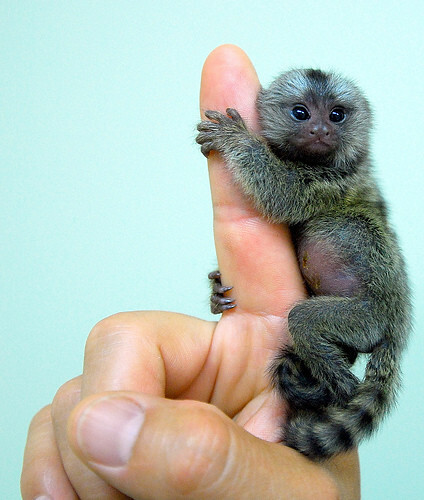 Baby Marmoset on Finger, originally uploaded by balisane. This is the cutest animal on the internets! A marmoset is a small monkey. But I had no idea they were so small! Ah, these are pygmy marmosets, the smallest monkeys in the world. The photo of a monkey clinging to a finger is from the Everland Zoo and Theme Park in South Korea, which had a safari theme park in the 1970s. The Lakes Aquarium, near Newby in the U.K., has baby twin marmosets. The babies spend most of their time riding on their father’s back. The father hands them over to their mother for nursing. I’ve just discovered a new saint: St. Tiggywinkles Animal Hospital in England. It’s an animal hospital for wild animals and treats them free of charge. The hospital relies on donations and, I suspect, sales of animal photographs to keep going. It helps some of the millions of animals that are injured by cars, poisons, and the built environment every year. Our veterinary team has pioneered much of the treatment now used for wildlife throughout the country. Our expertise and knowledge on all species is used worldwide. Over the years we have perfected techniques for hedgehogs, badgers, deer and other species and have a commitment to passing on this information through books, papers, courses and lectures to veterinary schools. The experiences of our Hospital staff are helping many of the millions of casualties across the world, most of which are now being looked after thanks to the positive attitude of Tiggywinkles. Tiggywinkles survives on a solid base of membership and relies on donations from the general public and sponsors to thrive. It receives no state funding of any kind and no financial assistance from conservation groups. “Tiggywinkle” is a nickname for a hedgehog. There are domesticated hedgehogs, as well. Dr. Marc van Roosmalen is trying to protect this new species of black, woolly monkey and other new species in the Amazon jungle. 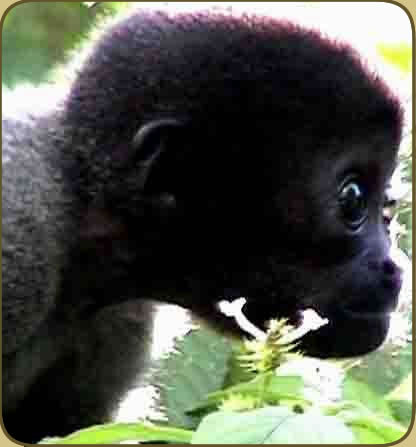 Donations will help to fund his research and protect the habitat for these animals. If he gets $31,000, he promises to name it the Blog Monkey — Lagothrix blogii. I found a blog called Paleomammals online, which got off to a promising start but hasn’t any new articles since May. But it did have links! One of them was to the scientific paleomammal and anthropology art of Mauricio Anton. The home page is in Flash but there are, at least, galleries underneath.